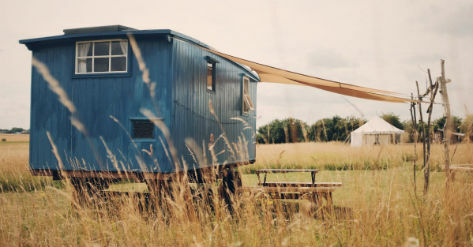 Lings Meadow is a small eco camping site on the Norfolk and Suffolk border offering glamping in a magical stardome, bell tents, and a living van/shepherds hut combination. It is the perfect quiet spot for hiding away amongst the tall meadow grass and stargazing around the campfire. We are only able to accommodate up to twenty five guests at a time so the site is naturally quite quiet and has a relaxed, friendly and communal feel. As we are small the meadow is also perfect for groups of family or friends who would like to book the whole site for a get together. The glamping accommodation and tent pitches are set in amongst the natural 4 acre meadow. The meadow changes over the season, with short grass and flowers in April and May, lush long green grass and swooping house martins in June, clouds of butterflies in July and tall golden seed heads in August and September. Each year we change the layout of the pitches depending upon which areas of the meadow need to be cut and which are given a rest and left to grow. 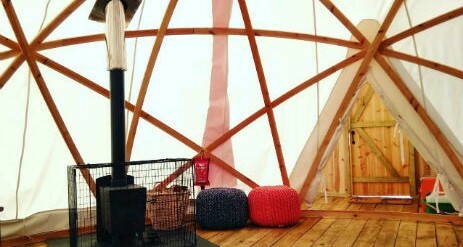 Somewhere between a yurt and a geodesic dome you will find the stardome. Curved wooden arches entwine to form a perfect hemisphere above your head and stars and pentagons are formed where the arches cross over each other. Covered in canvas, with a 6m wooden floor beneath your feet and a window above you to the sky, the stardome will be your magical home on the meadow. And on the colder nights you can warm yourself by the wood burning stove. The stardome will sleep up to six, in a double, single bunk beds and two single futon beds. It has its own area cut into the meadow with outdoor seating, a fire pit and campfire tripod and grill. If you prefer you also have access to the communal camp kitchen. We provide linen and towels for seven night stays, but we aim to be as environmentally friendly as possible so we offer glampers the choice to bring their own linen from their beds at home for shorter stays. Please bring sheets, duvet covers, pillow cases and towels. We appreciate, however, that you might be arriving late at night or just can’t fit everything into the car, so we also provide sets that you can hire for a small fee (£5 per person per stay). 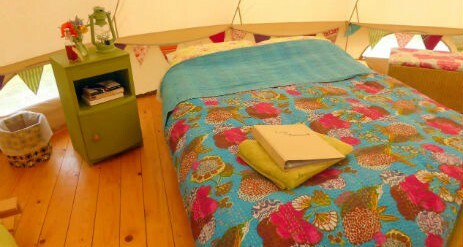 We love camping in our own bell tent and we are happy to admit that occasionally we enjoy a bit of luxury too. Because we enjoy it so much (and want to share the joy!) 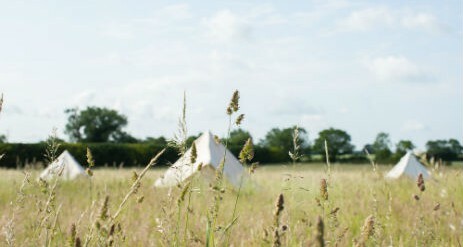 our aim is to provide an affordable bell tent camping experience. To give you the freedom to travel light we have equipped our 5 metre bell tents with most of the things that you will need for your stay. To keep things affordable however we offer extras such as provision parcels and bedding separately so that you can choose the kind of holiday that you would like. We have re-purposed original furniture from the farmhouse for storage and cotton bunting and crochet blankets add extra comfort as well as a splash of colour. The bell tents have their own areas in the meadow with a fire pit, tripod and grill, but if you prefer you also have access to the communal camp kitchen. The tent can accommodate up to four adults or two adults and three children. You might also want to bring ….. Your own gas stove and canisters if you would feel more comfortable using one that you are used to from home. If you are travelling light and can’t carry your own tent, if you are wondering what it is like to sleep under canvas, or if putting up your own tent just sounds like too much hard work, then there is always our pre-pitched bell to consider. At 5m in diameter it is incredibly spacious for two adults and a family of two adults and up to four children would still be very comfortable. It comes with a ground sheet but you will need to bring sleeping bags or inflatable mattresses and bedding with you. For a small extra fee we can add in a double futon mattress and bedding. The tent can be pitched on any of the six circular pitches on site with plenty of space around it to cook dinner or lay back and stare up at the clouds. Possibly the most exciting thing about the pre-pitched tent is that come rain or shine it will be ready for you when you arrive and you don’t need to pack it up when you leave! If the romantic in you is looking for outdoor living combined with old world charm then we could have just the thing. We fell in love with our Norfolk shepherd’s hut and handmade living van at first sight. They have both been lovingly restored using reclaimed materials and have found a home at the top of the meadow. 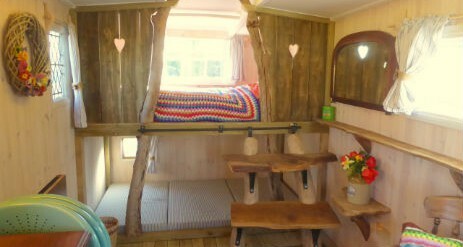 Windhover living van has two double bunks and Ranny shepherd’s hut has a pull out double bed. They both have side tables and seating. They can be used as two bedrooms for up to four people, or as a bedroom and separate living space. Both have windows on either side and a stable style door for your view out across the meadow. They also have their own wood burning stoves for warmth (although they are pretty cosy anyway) which can also boil your kettle. Ranny & Windhover come fully furnished with all the kit that you might need for your stay. We include duvets and pillows for the beds and you can hire linen and towels sets for a small fee. 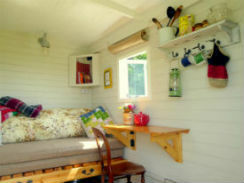 The hut and living van have been converted to solar power. We also provide a lantern and fairy lights. The solar panel next to the hut also provides power for two USB points. Outside Ranny & Windhover have their own sheltered seating area and a fire pit with hanging grill to star gaze around at night whilst cooking your tea. 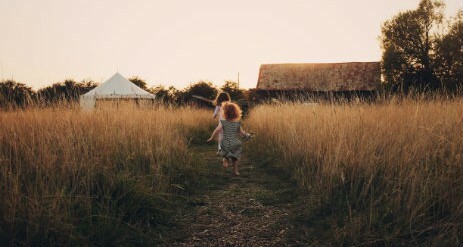 As far as we can we have tried to be true to their past, and the ethos of Ling’s Meadow, and want to capture that feeling of simple living outdoors. All of the communal facilities, compost loos, shower and bike shed, are designed to have as little environmental impact as possible and are together at one end of the site. Cut paths wander their way from here to the bell tents, huts and pitches. We believe that the meadow really belongs to the local wildlife, so we always leave a large section undisturbed for the roe deer, barn owls, tawny owls and hares. For the same reason we keep the meadow vehicle free (we provide trolleys for moving kit around). 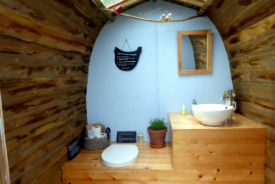 The farm is not connected to the mains and we have had to be creative when providing our toilets and shower. The farm philosophy has always been to tread lightly on the land and we want to continue to do what we can to protect the environment. Camping is just not camping without the opportunity to sit by an open fire, toast marshmallows and watch the sunset over the meadow. Our large brick-edged communal campfire is lit with lanterns, has log seating and looks out across the fields around the campsite. It has its own tripod and grill for campfire cooking. We also provide smaller fire pits with grills that you can use on your pitch. Seasoned logs can be bought on site (£5.00 a trug) or at the local farm shop. We provide eco firelighters and matches and we also have a fire lighting kit so that you can have a go at starting your fire with a flint and steel! Marshmallows are available to buy in our bike shed! Our camp kitchen has worktops and shared camping equipment for cooking and dining. It also has storage boxes for food and a cool box. We provide a single pot wood fired rocket stove for cooking. At night the kitchen is lit with solar powered lights. We provide facilities for recycling glass, paper and kitchen food waste. We also have a mini freezer for freezing your cool blocks in the bike shed. Tables and seating can be found in a large canvas communal tent with views across the meadow. To let you know about recent wildlife sightings, activity on the farm, local walks, cycle rides and upcoming events we have an information area here too. For budding naturalists we also have an explorer kit with identification charts and magnified bug boxes. A canvas covered washing up area can be found in the kitchen. There are two large butlers sinks with draining boards and eco friendly washing up liquid and tea towels. All of the water on site is drinking water but we also provide a stand pipe here to make it easier to fill up water containers. The sink is near to our rocket stove and when this is hot you can stand your kettle on the top to heat water for washing up (this helps us to save hot water for showers). Composting toilets are a great solution where conventional toilets are not an option and they provide a fantastic way of saving water. We want to do our best to help fuel the idea that composting toilets can be both practical and beautiful, so we have made ours spacious, light and airy with their own sink units, mirrors and potted plants. 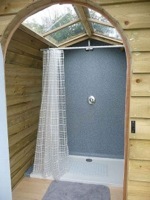 Our third wooden hut contains a large shower with space to get changed and hang up your clothes and towels. The water for the shower is heated using a combination of solar panels and our rocket stove. The water heats up in the afternoon, ready for showers in the evening or the next morning. When we are busy we don’t have enough hot water for everyone to have a hot shower every day so we ask that campers are considerate of others when using the facilities. We often overhear our campers comparing tips on how to save water and as well as making us smile, we know that it helps to boost the communal feel of the site. We want to encourage our campers to use sustainable transport where possible, so we provide a secure bike shed on site that can take up to six bicycles. As well as bike stands it contains a bike pump, puncture kit and a cycle map for Suffolk. We also have a small selection of bikes that can be used free of charge during your stay. We make sure that the tires are pumped up and they are ready to go, but all of the bikes are second hand and have seen many adventures before so we ask that you check them to make sure that you are happy before you set off. Some of our campers arriving in the evening miss out on the local Farm Shop, so we offer a range of provisions parcels that can be delivered to your tent when you arrive. All of the produce is sourced locally or baked or grown at the farm shop. We would be grateful if you could give us plenty of notice so that we can place your order with the farm shop well in advance, but it is possible to order up to a couple of days before your stay. We will provide a cool box for items that need to be kept cold. Parcels cater for between two and four people depending upon your appetite! An option to request a parcel is provided on the booking from. Just let us know which parcel you would like and which bread option you would prefer. Some of the contents may vary slightly from time to time depending upon availability.